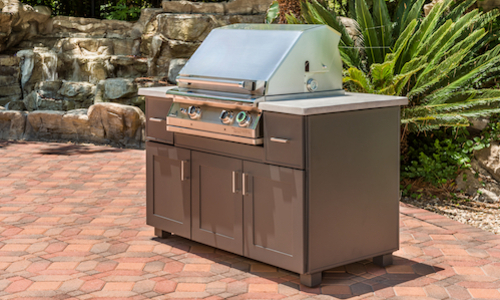 Products offered from the two companies include; grills, side burners, beverage centers, refrigerators, patio heaters and ambiance fire features from AEI Corp.; furniture, tables, kitchens, fire pits, umbrellas, pillows and outdoor accessories from Gensun. Both companies offer products that are high quality with great value. Both companies offer products supported with excellent customer service. Both companies support the independent retailer and both companies do not sell to the “Big Box” stores. Gensun has the proud history to be the industry leader in manufacturing aluminum outdoor furniture and kitchens. “We use cast, extruded and stamped aluminum, combining these materials with woven vinyl, fabric, strap and high-pressure laminate to create beautiful furniture and kitchens that will withstand the heat and cold, ocean and desert, wind and rain,” says Jan. Retailers will have the opportunity to see the products from both companies at the upcoming ICFA Premarket in July and the ICFA Market in September. The companies will also be showing their products at many hospitality, design, builder and multi-family shows.